Maintaining gutters is the most important thing you can do to prevent water damage to your home. Gutters are designed to do one thing — channel water away from the foundation — and they’re critical to protecting the structural integrity of your house. But in order for gutters to do their job properly, they have to be kept in shape and free of clogs, holes, and sags. 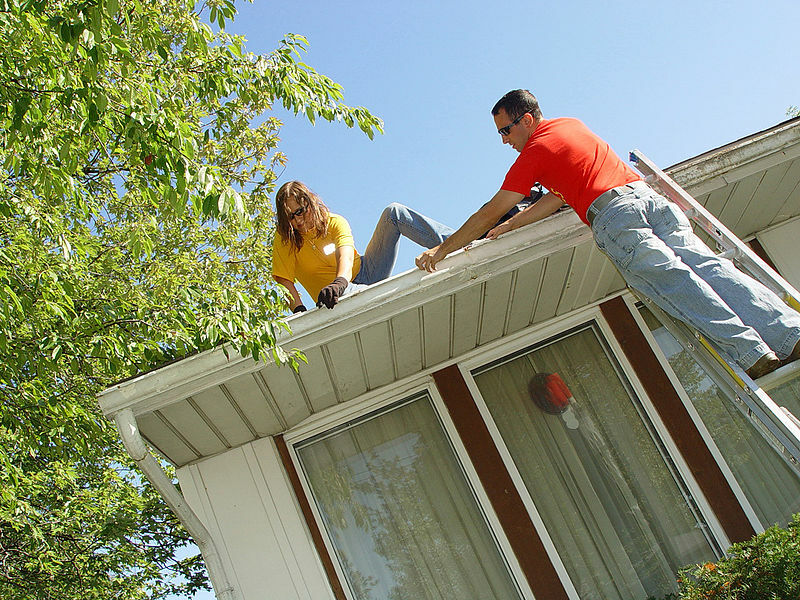 Luckily, most common gutter problems are easy for homeowners to fix themselves. And it’s worth the effort. “Gutters are one of those things where routine maintenance and inspecting them can really prevent bigger problems down the road,” says Jason Stutzman, director of home maintenance and repair for Brothers Redevelopment in Denver. Here are the gutter problems that the pros see most often, and the recommended solutions. This is the most common problem of all. Left untended, gutters and downspouts get so clogged with debris that they’re rendered useless. The excess weight of leaves, twigs, and standing water can also make them sag and pull away from the fascia. You can clean your own gutters if you’re comfortable on a ladder, don’t mind getting wet and dirty, and don’t have an extremely tall house. After you’ve cleared the muck, flush them with a garden hose to make sure they’re flowing properly. If you’d prefer, you can hire someone to do the job for you for between $50 and $250, depending on the size of your house. This is usually a problem with the hangers, the hardware that secures the gutters to the fascia. They might have deteriorated over time, the fasteners may have backed out of the wood, or they’re spaced too far apart to support the weight of full gutters. The cost to fix it yourself is cheap; hangers generally cost $10 or less apiece, and the fasteners run about $1 each. Leaky gutter joints can be sealed by caulking the joint from the inside with gutter sealant, says John Eggenberger, vice president of training and corporate development for the Mr. Handyman franchise of home repair companies. A tube costs about $5. Very small holes can be filled with gutter sealant. Larger holes will require a patch. If you can’t find a gutter patching kit at the hardware store, you can make a patch from metal flashing. Gutters need to be pitched toward the downspouts for the water to flow properly. You want at least a quarter inch of slope for every 10 feet. Get on a ladder after a rainstorm and look in the gutter; if there’s standing water, it’s not pitched properly. To correct this yourself, you’ll need to measure from the peak to the downspout. Snap a chalk line between the two and find the spots where the gutter is out of alignment. You might be able to push it up into place by bending the hanger. If that doesn’t solve the problem, you might need to take a section down and rehang it. If you have seamless gutters, call the company that installed them to correct the problem. Downspouts need to extend several feet from the house, or they’ll dump right into the basement. Gutter extensions attached to the bottom of the downspout will discharge water well beyond the foundation. They’re inexpensive and easy to install. “I like the downspout material extended four or five feet and screwed on,” says Reggie Marston, president of Residential Equity Management Home Inspections in Springfield, Va. Cost: less than $20 per downspout. If your house has no gutters at all, consider investing in a system. The cost depends on the material. Most residential gutters are aluminum, which is lightweight and durable. “Unless an aluminum gutter is damaged by something, it will last forever,” says Scott McCurdy, vice president of Jacksonville, Fla.,-based disaster repair contractor Coastal Reconstruction. Vinyl, galvanized steel, and copper also are available options. Aluminum gutters range from about $4.50 to $8.50 per linear foot installed. On a 2,000-square-foot house with about 180 linear feet of gutters, that’s roughly $800 to $1,500.